Quality products is what you will find here in our facility. As our counter part makes full custom closets and understands every aspect of quality and construction, we purchase the same only on a more productive level with a great selection of custom colors and finishes for you to choose from. Pohl’s closet organizers by Cabico are made with solid ¾ solid wood, full panels, non-vented: we only use the best quality cut solid hardwood in our inventory. Then we use a state of the art paneling process to sand/ prepare, stain every detail on every piece to a multilayer finish process that brings perfection and character to the homeowner for years to come. To prevent sagging, the hardware used is heavy-metal brackets and connectors ensure stability and 1” diameter steel metal hanger rods and flanges, refined in Brushed Nickel. Because the use of free standing (not wall hanging) solid wood organizer systems our closet organizers are very secure and easy to install. You will not need to remove or cut existing baseboard as a clearance is built into the design of the floor standing vertical tower. The closet system can be designed to configure and installed in various ways to fit your organization needs. The closet organizer systems can fit a closet space up to 10’ wide and can be adjusted to the size that suits each individual user’s needs. Also available are high-end, functional, closet hardware accessories like Baskets, Hamper, Tie Rack, Belt Rack, Pants Rack. Again all hardware accessories are finished in Nickel. Here at Naples Kitchen Cabinetry and Design of Naples, our Designers will guide you through the correct process to choose your storage solution or closet for your needs. We offer full closet and storage area design. Specifications are solid 3/4 plywood/ or prefinished plywood, with a finish that will last a lifetime. 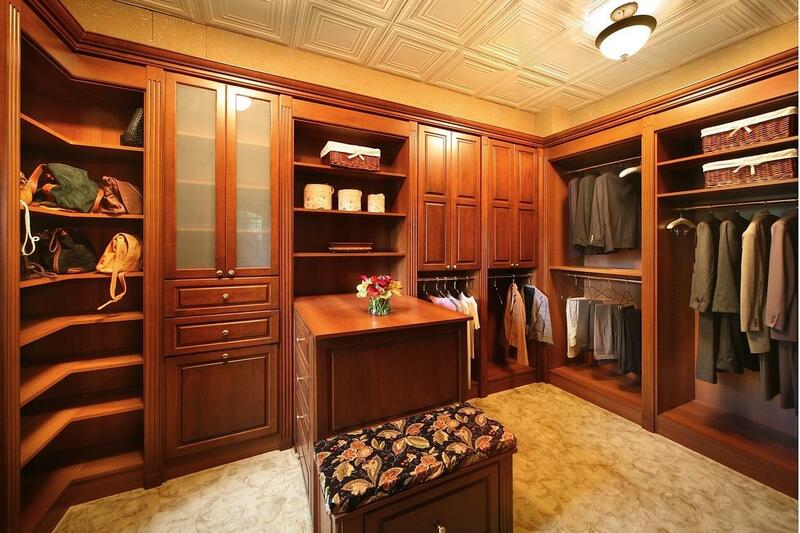 Classy Custom Closet Systems For Naples Residents! Get custom closets made from the expert designers here at Kitchen & Bath Cabinets By Pohl! We have been established as leaders in furniture design, and that includes not only cabinets but custom closets too! We offer only the best standard of quality when it comes to solid wood closets, ensuring that they are prepped and finished to perfection. Our custom wood closets are all constructed using a state-of-the-art paneling procedure, where the finishing process achieves an end result that can bring clients utmost satisfaction. Our services include the provision of closet related accessories too. You can get the needed hardware fitted in your closet, from tie racks and belt racks to baskets and hampers. Any hardware you purchase fits seamlessly into our closet systems. The closet we design and construct for you is made with the purposes of operating at maximum functionality, with not only sturdiness and stability to it, but also a touch of personal style and elegance. Call us at 239-643-5661 and get a consultation with our manufacturers who can guide you through the creative process. It’s a collaborative process – your closet must fit in with surroundings that have are a result of your exquisite personal preferences and standards, and at we value the importance of providing you with the kind of product that matches up to these standards!